When I got it. Pretty sad. Been wanting one forever as always liked the looks of them. Finally found one in my price range on Craigslist a few years back. Got ahold of the seller, said didn't run, no spark. Go look, strike a deal and brought her home. Pretty much let it sit for about a year and a half to two years. Finally got the urge to look at it. Guy had all the safety switches half bypassed. I put everything back about the way it was, noticed a couple of wires that had been cut. Put wires together and new plugs... Woo hoo, spark. Would kind of sputter, but not run. Different carbs off of evil bay and runs pretty good. So far I have changed out the front brake master cylinder for one off of a 2012 FZ1000, clutch master from a 94 YZF750... Did the turn signal flasher mod, and as of now waiting for parts. Have a pair of GSXR mirrors on the way, and a f4i shock coming. Have new tires as well, but going to wait until next year to put them on. Picked up a piece of vinyl, going to attempt to recover the seat. Will let you know how that goes. In the event it does not work, there are some nice seat covers already posted with embroidered FJ text. Recovering has never been a talent of mine. Post up your technique and end results. We love pictures and success stories. Yeah, I have never tried a seat. I know the material I have is probably not the best, I just got the stuff at Walmart, $5 a yard. For $5 I got enough for 2 tries... Seems pretty pliable, and regardless, have to look better than the worn out and ripped up cover. I will take pics, depending on results, will post the pics... I am budget building this bike. Tight budget at that. 1985 FJ, V&H4-2-1, Sport Demons. Keep the old seat covering, as a last resort retreat position. Any good upholsterer could also use it as a pattern, for less money than a start-from-scratch job. Beg, borrow or steal a bowlful of spring-type clothespins. Old people will know what they are, and may even have some. Same goes for a heavy-duty staple gun, hand or powered. You will need heavy, short-shank staples there (all heavy staples are not the same). Borrow a hair dryer. Cut a piece of vinyl large enough to cover the seat from side-to-side, and end-to-end, plus a few inches at each side and each end. Do the sides first, pulling the material smooth, wrapping it under the plastic form, and clipping the spring clothespins over the edge of the plastic seat form. Keep pulling, wrapping, and adding clothespins until you have one clothespin every two inches or so, and more in the trouble spots. Release each clothespin one at a time, pull the material smoother, then re-clip. Do that all along each side, as much as necessary, until you like the results across the sitting area of the seat. Use the hairdryer to warm the vinyl here and there, to get smoothness, but do not overdo the heat. The vinyl should definitely compress the foam somewhat, but not excessively. Pull the end material smoothly over the ends, and shoot a staple or two at each end. Figure out how you want to fold in the excess material at each of the corners, to be neat, but if you cut any material, that will be a one-way trip with no going back. You do not want any cut edges showing anyway; cut edges just look bad. When everything is looking good, start shooting one staple in each side, jumping from side to side and end to end for each new staple, always going half the distance between the nearest two staples. Shoot the staples where they will enter foam, not vinyl, on the outside of the seat form. Shoot each new staple between the widest space between the staples, for each new staple. Do the ends in the same way; shoot one staple in each end at a time, pulling the material smooth as you go. Staple the folded corners last. Remove all of the clothespins, and test-fit the seat. You may need to dig out a staple or three to correct any glitches, but that is to be expected. When all is looking good, you can cut away any excess material beyond the staples with a utility knife or other sharp blade. I way over did my homework on making my own cover, researching materials, threads, patterns, the proper sewing needles and an upholstery foot for the sewing machine and in the end opted for a ready made cover from Sargent. This Sargent: Sargent Cycle Products North America, Jacksonville FL. (There's another Sargent that does upholstery). U.S. $59.95. I would have been spending that much just for the minimum order of 2 kinds of vinyl material I would have used. If someone's not aware of it, there are vinyls that stretch in both directions (one way stretch has been around for longer). Check out "All way" or "4 way" types of vinyl. It would be much more forgiving of you not getting your pattern dimensions correct. Err on constructing the panels on the snug side and you can stretch this stuff in width and length instead of ripping something that's too small or puckering something built too generous. Even with the Sargent cover, I slit a length of thin wall tubing and ran that around the edge of the seat pan because some of those hard plastic corners were just going to start wearing through my new cover over time. It gives a nice radius to the edge but you also have to apply a thin foam sheet butted up to the tubing so it all blends in under the cover. Live and learn. Had to lay 'er down? If the side of your bike has better braking than your tires, might be time for some new rubber. Is it better to upgrade the 85 forks, or go up to 89? And go from there with the 17" wheel and better brakes? What does "better" mean? On the day that I decide on a 17" front wheel, I will change everything (forks, calipers, wheel, axle, handlebar adapters, fender) from the steering bearings and forward, with an eBay special used front end assembly. No worries about piecing all the things together, and wondering if everything is gonna work or fit, and ending up with a huge total bill. Just one and done, with the right donor parts as an assembly. 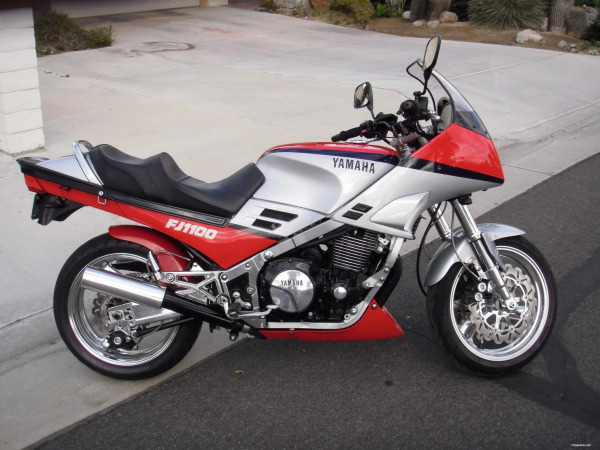 Go straight to the '89+ forks and lighter 17" front rim....(even better if you can find a '87/88 3.5"wide FZR1000/750 rim) Consider the Yamaha monoblock calipers frosting on the cake. ....and call it a day. You will thank me when you go to buy a front tire.